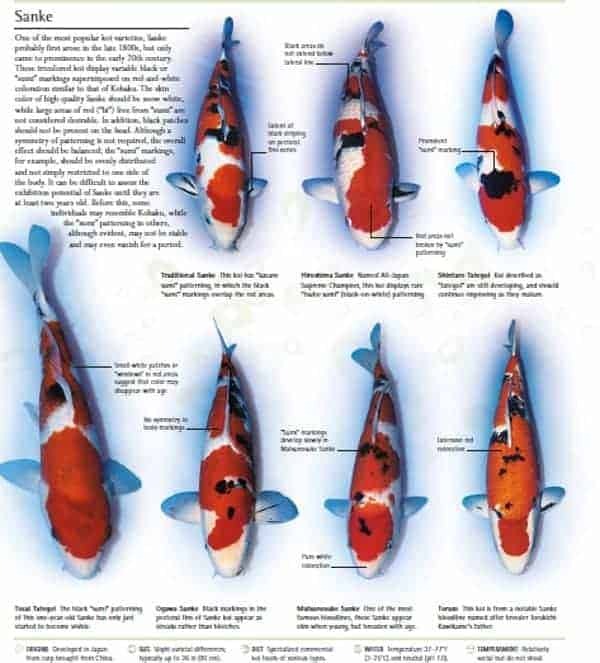 Types of koi fish Koi Variety Guide to identify your favorite varieties, or learn a little more about each variety. It was bred by Mr. Sawata Aoki and his on in 1946. First he found a koi with golden lines on the back and made it a parent. He chose the best golden koi one generation after another. In the fourth or the fith generation a Kin Kabuto golden headed koi and a Sakin gold dust koi were breed. Mating them with a female Shiro-Fuji (White Mt. 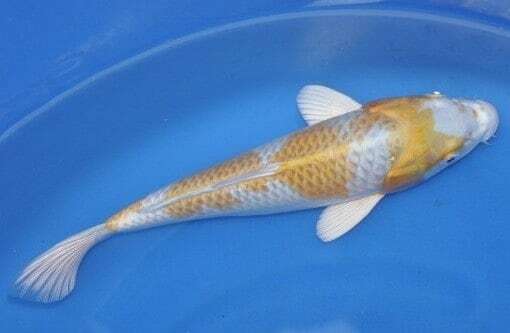 Fuji) a golden koi was finally bred. Being hybridized with other species, the Ogon is an Origin of many kinds of the Hikarimono. Sawata Aoki, a Niigata peasant.In 1921, Mr. Sawata was walking along a mountain path toward the river, carrying his lunch, when he met up with a boy who had caught a carp with golden scales on its flanks. Sawata was so deeply impressed that he bought the fish at the first price asked. He spawned the fish and selected from the offspring the ones with the most golden color. After four or five generations, he had produced ones with golden heads, silvery heads, and other varieties. He purchased more breeding stock until he became too poor.He wanted a new breed known as gin-fuji, but the price was 60 yen, the cost of a large bag of rice. That was too expensive for him.If he had bought the fish, his family would have gone hungry. Knowing her father’s troubles, his daughter left home to work as a health nurse for six months. Upon returning home, she gave her father her salary of 60 yen to purchase the parent fish. From the spawnings that followed, two ogon with an entirely golden, shiny body were produced. “It was just after the end of the war World War II) and food was scanty, however, his family supported him to feed the koi by reducing their own food. In spite of rain or wind, Mr.Sawata went to and from the pond with an empty stomach to feed the koi with locusts that he had caught and crushed with his teeth. After many years of effort, at the age of 74, he finally succeeded in producing the ogon. Its scale has golden trimmings. 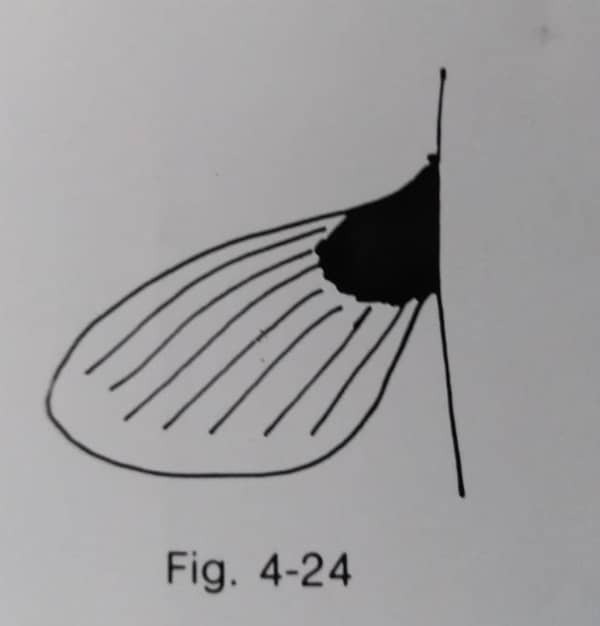 If a fish has these scales spreading on the abdominal region, too the fish is valuable. The pectoral fins should be shiny. The fish should be well-figured. IN the case of the “Doitsu-Ogon” it should have neatly lined scales without a redundant scale. In 1963 Mr. Tado Yoshioka of Uozu city-bred a koi as shiny as platinum, mating a Ki-goi with a Nezu-Ogon. It was bred by Masoka in 1957, a Ki-goi and an Ogon being mated. The fish shines like pure gold. It is red Hikarimono. The points for appreciating Plati-num Ogon and Hi-Ogon are the same as those of the Ogon. It is especially important that their heads are clear and their scales have shiny trimmings. It is the Ogon of the Doitsu family. It is the Orange-Ogon with shiny black scales on the back. A hoe-shaped pattern shines golden or silver on the head of a black carp. Scales on the black body have golden or silver trimmings. It is rubbish of the Ogon, Most of these kind are culled and thrown away. These are also rubbish of the Ogon. Their back shine golden or silver on black texture. What is an Ogon Koi? Ogon koi are a single solid colour with a metallic appearance. This variety is very popular, particularly with those new to keeping koi. These fish can be a variety of attractive colours. Cream specimens are rare and the most popular choices are bright yellow (Yamabuki Ogon) and Platinum (Purachina Ogon). What is a ghost koi? Ghost Koi has human face! … A cross between a Koi carp and a wild-type mirror carp, Ghost koi are known for their hardiness, big appetites and, above all, growth. But a Koi is only worth what someone will pay for it – and for a Ghost koi even less. In this article. I am discussing about different types of kohaku koi fish variety and its genalogy history. What are the kohaku koi fish ancestors and how they got their coloration and patterns that we see today. A koi fish variety that has a white skin and a red pattern is defined as a Kohaku koi. The kohaku koi is a representative class of the Nishikigoi. Though its color is plain only white and red. It reminds all the Japanese of their national flag of Japan. In the koi world, there is a saying, “Keeping the Nishikigoi begins with the Kohaku and ends with the Kohaku. First people are attracted by the beauty of the Kohaku koi and charmed by the Showa or the Ogon. But finally, they go back to the Kohaku koi again. 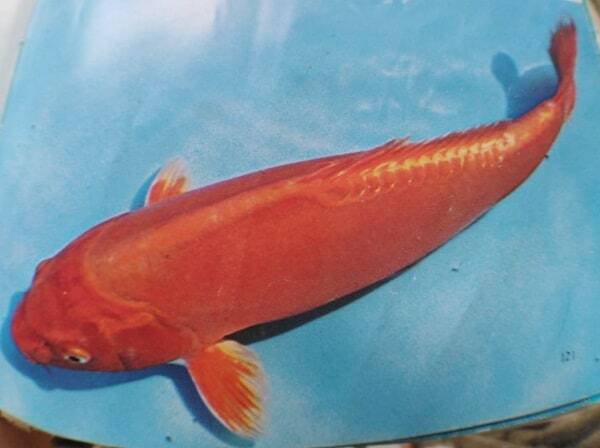 That means that Kohaku koi is the prototype of the Nishikigoi. 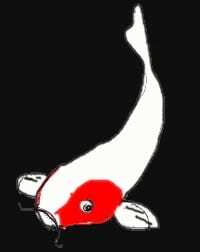 It was around 1800 that a red and white koi appeared for the first time. 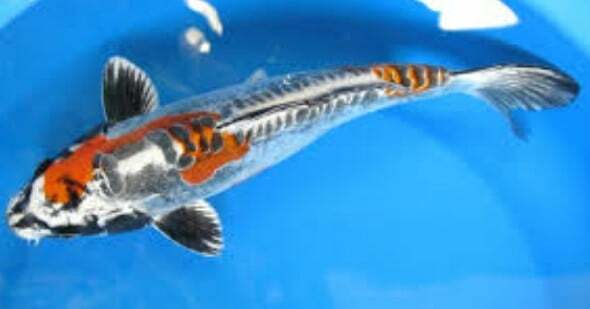 By mutation, a koi with red cheeks called “Hookazuki” was born from a black carp. 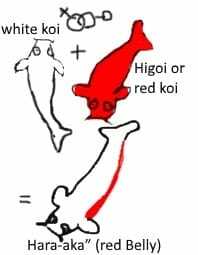 The white koi being mated with a Higoi, a white koi with Hi markings was breed and called “Hara-aka” (red Belly)”. Later kois with Hi markings on the gill covers “Era-Hi (Red gills)” were breed. Later than 1830 a “Zu-kinkaburi” whose head is partly red, a “Menkaburi” whose whole head is red. An a “Sarasa” which has red and white markings on the back were breed. In the Meiji era Kohakus spread all over Yamakoshi and were improved. 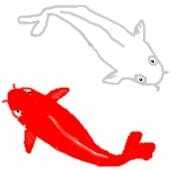 It was by Gosuke of Utogi that so-called modern Kohaku was breed. Utogi is a part of Ojiya City now. His real name was Kunizo Hiroi. He mated a male koi of the cherry blossom pattern with a female which had a redhead. A Tomouemon inherited Gosuke’s excellent Kohaku and Yagozen and Buheita followed him. 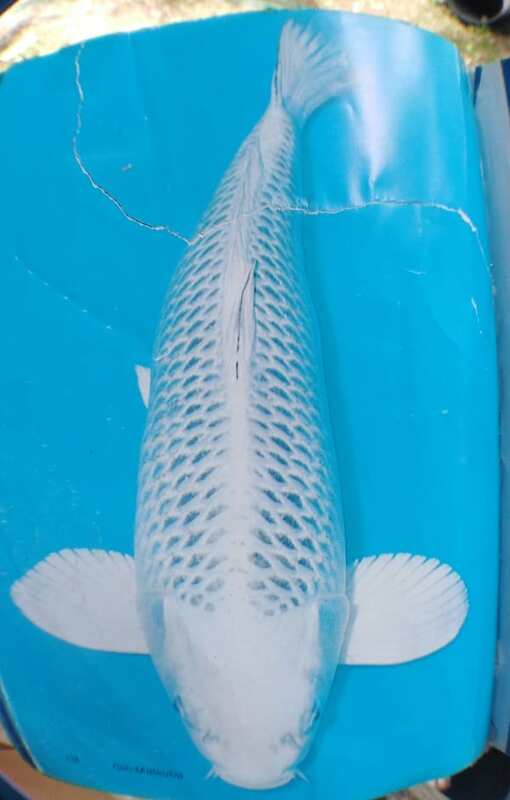 Good white texture is the most important element in the case of the Kohaku. It must not be yellowish or brownish but should be snow white. Dark but bright Hi is Preferable. There are two kinds of Hi one’s base is purple and the other base is yellowish brown. The former Hi is darker and does not fade away easily but unrefined. 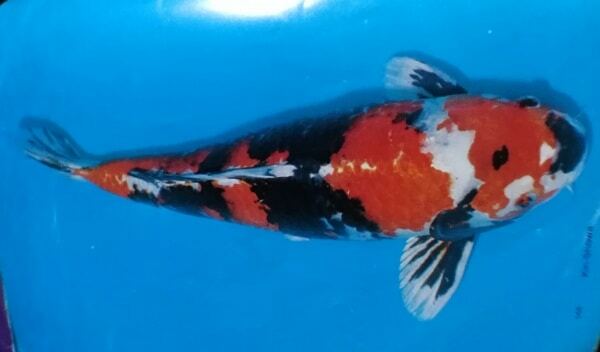 Kohaku is one of the most beautiful koi with its pure white body and intense-red patterns. Hi (red) must be consistent, evenly colored, without thin, discolored spots. Red is not desirable on the fins. The edge of the red pattern must be sharp and clear against the white background (this edge is called “kiwa”). The red pattern should be artistically well-balanced. One of the most important factors to be considered is the body conformation. Don’t choose a Kohaku simply because it has a beautiful pattern. problems that will eventually result in health problems. Omoyo: one step pattern. A continuous, large, unbroken pattern from head to tail. Straight Hi: Single, continuous Hi pattern, but the red patches are interconnected. Nidan: two step pattern. Two islands of red color that are not interconnected. Inazuma: pattern resembling a lightning strike; zig-zag pattern. (with no other red on the body). Kuchibeni: red lipstick-like markings, red (beni) on the mouth. Menkaburi: “hood” pattern – going behind, below the eyes often to the mouth. on the rest of the body too. Kohaku are sensitive to water conditions. In hard water they will develop small black freckles (called “shimi”) on the skin. contribute to the development of the red (beni). In very young koi the red starts out as a pale yellow and, in time, it changes to orange and later to red. Males tend to develop the red faster than females, but their color also tends to diminish faster. last longer, this aspect making them more desirable among the hobbyists. Kohaku There are fundamental points to look for in a kohaku. Pattern for the head, body, the tail, and the fins. patterns on the body, a koi without a head Hi will be amoung the first culled. a head Hi which spreads all over the head is not preferable. the lips, and not covering the cheeks and jaws is also disliked. The ideal end line of the head Hi is the nose line, and at least down to the eyes. A head Hi that is neither too large nor too small is preferable. The head Hi should not spread down to the mouth tip, if it is split in some place, no mouth Hi is acceptable. The head Hi must not cover the eyes, jaws, and cheeks, but must be as large as possible. The back should have a pattern well-balanced on both sides. A large mark on the shoulders near the head makes a Kohaku look imposing. A V shaped white cut on the shoulders is desirable. A continuous pattern from the head to shoulders without any cuts looks dull. The distance between the last Hi and the tail joint should be about 2cm. over the tail is disliked, no fins should have Hi. different but should show a clean cut edge. The Kohaku should look imposing, elegant and the pattern well balanced. lateral line, head Hi that does not spread below the nose, and tail Hi that does not spread over the caudal fin. and unless specified in a particular sub-variety, not below the eyes or on the mouth. Inazuma: Interconnected red pattern looking “Like a Lightning Bolt”. Kuchibeni: “Lipstick”; with red on the oral lobes. Menkaburi: With “A Hood on the head”. Going behind, below the eyes often to the mouth. Maruten: With a “Crown on the head”. A reddish mark, though with more red on the body. Tancho: With a “Red Sun” marking on head, and lacking other red on the body. Best if the “spot” is bright red, w/o bleeding color, and circular, centered on the head. Koh-haku koi are the cornerstone of any serious koi collection. 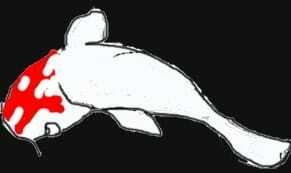 They are fairly simple in appearance, with red markings on a white body. and they commonly win the “grand champion” award at prestigious koi shows. It is said “appreciation of koi starts and ends with Kohaku”. 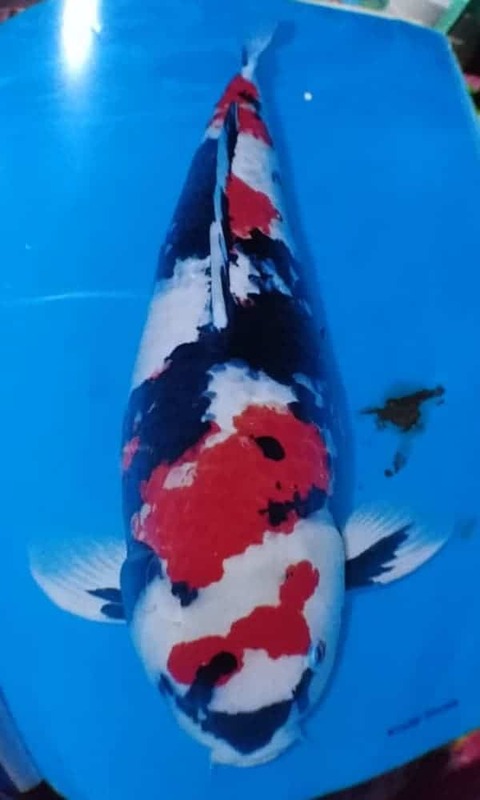 What that means is Kohaku was the first class to be bred consistently or stabilized in about 1890.
will come back to appreciate Kohaku for its simplicity and beauty. I will keep the amount of Japanese terminology to a minimum in this lecture. A Japanese term dictionary will be available soon in KOIUSA magazine and on the AKCA website. Before I continue on Kohaku, I want to take a minute to discuss judging points common to all classes. Koi are judged as a whole or holistically and are not judged on a positive or negative point system. Negative points can come into play in close contests. Koi are judged side by side based on what we see today and not what may be there next week or next year. decisions because they know which koi cost more and has more potential. award replying, “because it was the most expensive fish”. Koi may lose today only to come back to win tomorrow based on the competition tomorrow. abnormalities like a pushed in mouth all of which will disqualify the koi from judging. The exception is the second set of barbels. parasites, which could disqualify the koi from judging. An exception is made for split fins or bruises judged to be caused during transportation. Third, is the importance of body conformation. imposing appearance when compared to the thin trout shaped body of a male koi. Shape and size of the fins are important to be in proportion to the body. The head shape is important that it not be too short or too long or turn to one side. The koi when viewed from above should be symmetrical on both sides and not have one side flatter than the other. Even the way a koi swims is taken into account on conformation. Not all female koi hold their eggs well, which could affect conformation. Fourth, in my opinion is quality of skin and deep, vibrant colors, which makes koi “living jewels”. This also includes how well the koi is “finished”, are all of the colors up, and is there a good sheen on the skin. It is conformation and quality that will catch a Judges eye from a distance. Fifth is pattern that is artistically balanced and not front, tail or side heavy. a small pattern on a huge body or a huge pattern on a small body. Last is uniqueness or character usually of the pattern on the head that makes this koi special. 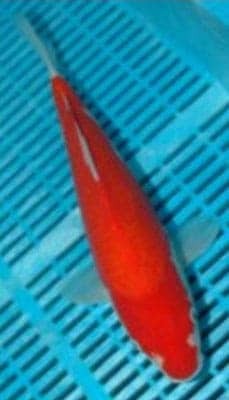 We have a snow white (shiro) base color with a red (hi) pattern. The pattern may be stepped or continuous. The white must be without blemish or yellow tint. spots and the pattern must be the same color from head to tail. because the orange appears soft and the purple red appears hard and gaudy. 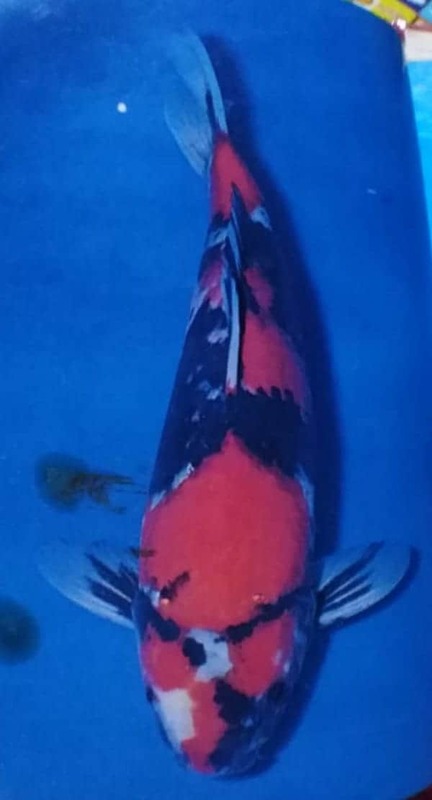 Kohaku must have red pattern on the head. or rear edges of each spot must be sharp like cut with a razor. than a straight edge across the center of a scale. The front edge of each spot (not on the head) may have blurred red color that is called “sashi” or insertion. Sashi indicates the koi is still improving in quality and is not finished yet. red pattern just in front of the tail called a “tail stop” and several other names. down the face to the nose that are heavy in appearance. when the red and white are better balanced. Red spots below the lateral line are disliked. The lateral line is a raised sensory organ running the full length of a koi half way up the side of a koi. “kuchibeni” and can be cute if it balances the overall pattern. unfavorable but is being accepted now if it adds to the overall balance of the pattern. 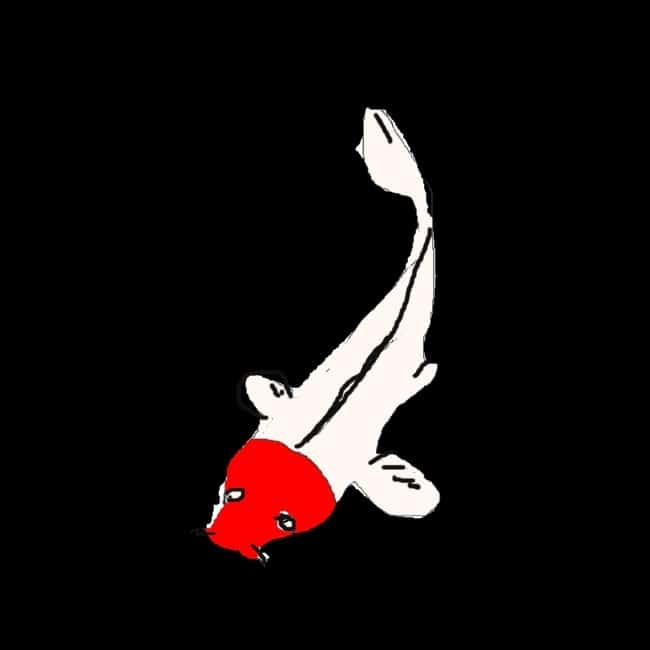 Red into the tail or into the dorsal fin is still disliked. 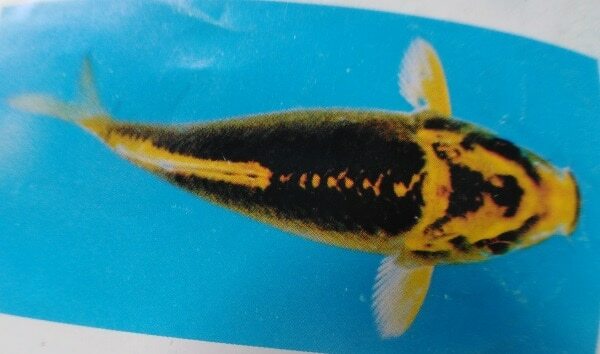 Kohaku tend to get black specks “shimis” in hard water with high pH. How many types of koi fish are there? 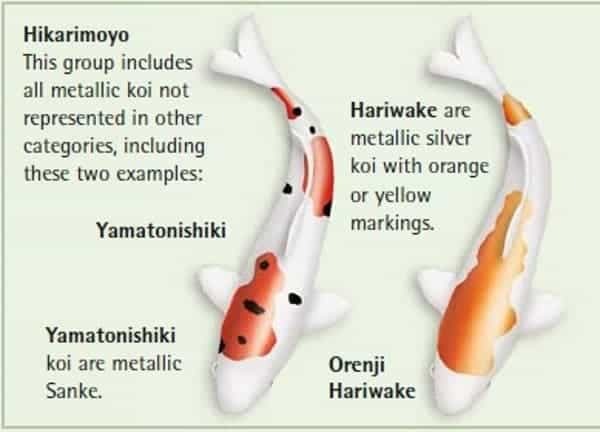 Types of Koi Varieties. There are over a 100 different types of koi (Nishikigoi). Can you have koi fish in a tank? Keep koi in large aquariums for a few months at a time. If you live in an apartments, you may have to keep koi in aquariums for their entire life. That is possible, as long as you do not overcrowd the aquarium with too many koi. … Your tank should have 1 cubic foot per 1 inch of koi fish length. What does the name kohaku mean? Kohaku (琥珀 Kohaku) is the Japanese word for amber, and a Japanese name. There are fourteen different varieties of Koi, with a fifteenth variety that is used as a sort of a catchall variety for all of the different types of koi that do not quite fit into one of the other fourteen slots. This last variety is known as the Kawarimono, and a large percentage of Koi are placed in this category. Inclusion in this variety has no bearing on the quality of the Koi. Placement in the fifteenth variety simply means that there is something not quite right about the fish. It may be attractive and healthy, but it does not fit the “breed standard” for any of the individual varieties. 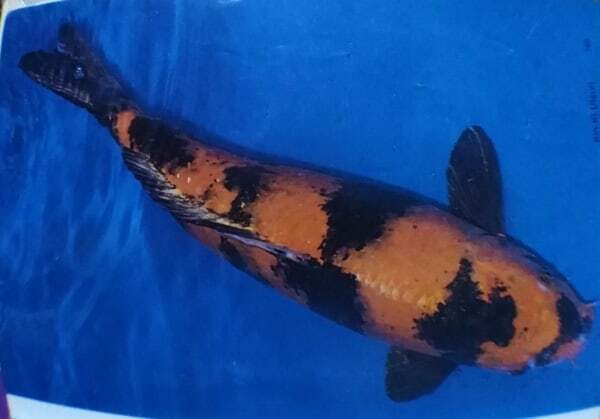 All Koi have a unique beauty, but those who are entered in shows must resemble this standard. The many different color varieties that you will see were brought to fruition by crossbreeding fish that are closely related to each other. Crossbreeding tends to make a genetic line more stable, bringing out the good qualities while pushing back the bad. 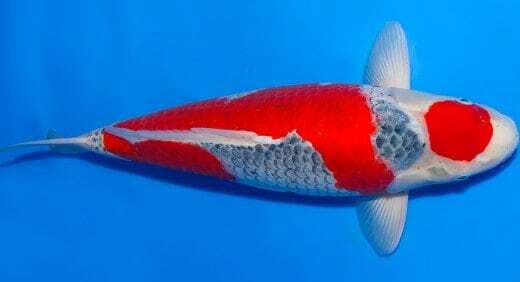 Those who are preparing to be Koi breeders are advised to learn about the different types of koiv arieties so that they will know which ones they are interested in breeding and raising. The Asagi Koi is one of the initial varieties of Koi. The body of the Asagi is a blue color, with the lighter shades of blue most preferred. The scales on the skin of the Asagi are given high importance. The edges of these scales must all be equal in length, and must be on the entire body of the koi from its tail to its head. 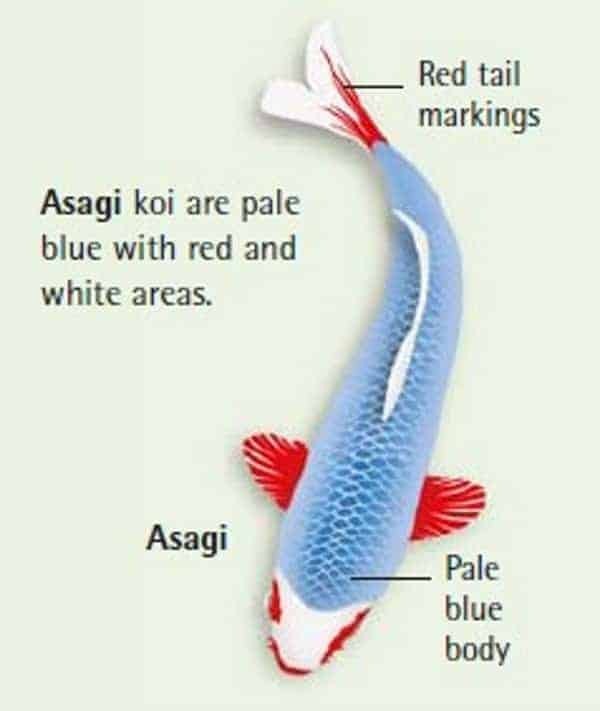 The red (Hi) color that appears on the sides of the Asagi, on the head, and on the fins sometimes looks more orange than red. 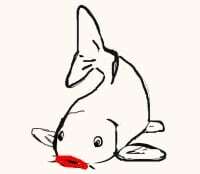 The Hi needs to be symmetrical on both sides of the Koi’s cheeks all the way to its eyes. The Utsurimono should be heavily marked with black (Sumi) in order to display a prominent contrast with the yellow, red, or white. All colored need to be somewhat balanced, as this helps to call attention to the pattern on the Koi. 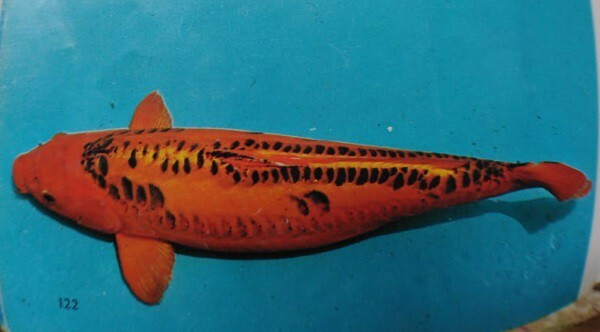 The Utsurimono is sometimes mistaken for the Bekko koi. There are two differences to look for that will allow the observer to tell the two varieties of Koi apart. 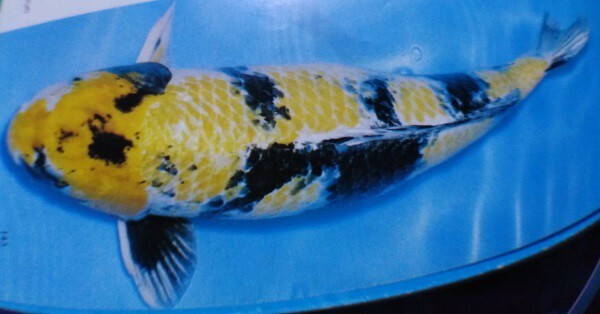 The main variation is that the Utsurimono is a black Koi with red, white, or yellow markings, while the Bekko Koi are either white, yellow, or red Koi that have black markings. The Utsurimono also feature black markings on their heads that run all the way down to their noses. The Bekko Koi do not have black markings in this area. 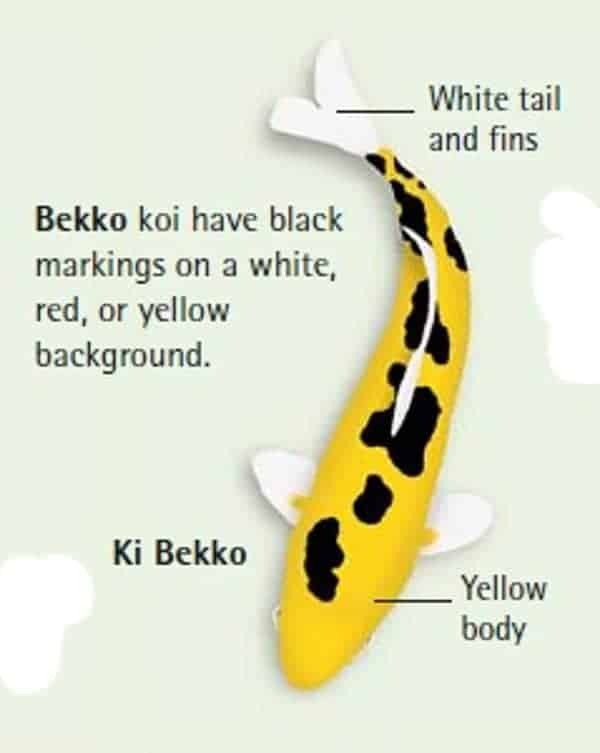 The Bekko variety is a white, yellow or red Koi that can be identified by the unique black markings. 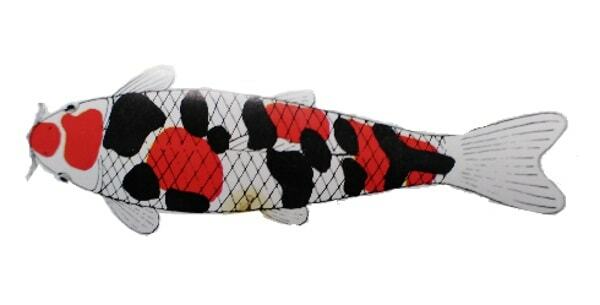 This assortment has small and very simple black markings that are not included on the head of the Koi. The Shiro Bekko is white with black markings. The Aka Bekko is red with black markings The Ki Bekko is yellow with black markings, and is considered to be rare. The Shusui is the result of a crossbreeding that took place in 1910. One Yoshigoro Akiyama crossed an Asagi Koi with a Doitsu Mirror carp. He ended up with a fish he called the Shusui. The color of this Koi is comparable to that of the Asagi. 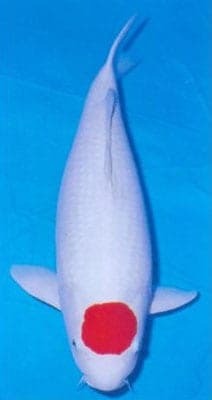 The Shusui has a head that is a bluish gray color, with red on the jaws of the Koi. The skin is a lovely sky blue, with darker fish scales outlining the lateral and dorsal lines. 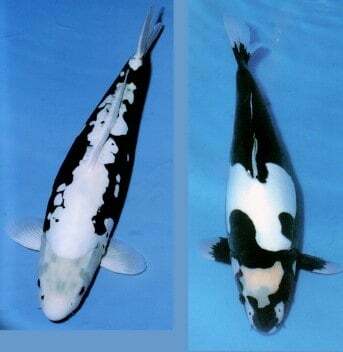 The Koromo koi is a relatively new type of Koi that appeared around 1950. The Koromo came into existence by crossing the Kohaku with the Naruni Asagi. 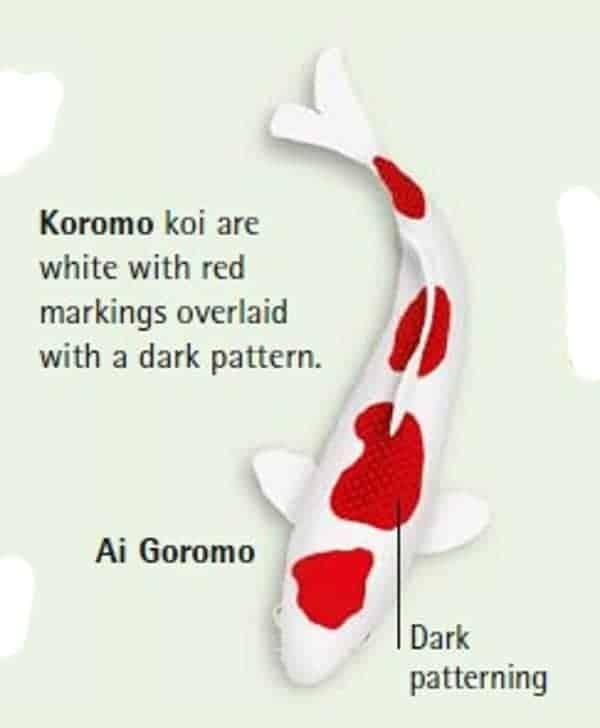 The Koromo has a lovely pattern of deep red edged with black on a white background/body. The red is described as being in a lace pattern, and the markings of the Koromo are prone to variations, depending on which variety you are looking at. Budo Goromo are a Goromo with shading that completely covers the Hi, creating a purple color. Budo means grape in Japanese. Look for a Budo Goromo with a Kohaku pattern on it’s back. What makes an Budo Goromo? Goromos were created by accident. In Japan, the word “goshiki” means five colors, which are red, white, black, dark blue and blue. All of these colors can be mixed on the body of one fish. The result of this is a Koi that has a rather purplish tint. Originally created by crossing the Asgai Koi with the Sanke Koi, the Goshiki has patterns that are quite striking. These surprisingly lovely fish are very popular with those who keep Koi as a hobby. The Kawarimono classification is given to many non-metallic fish who do not seem to fit in any other variety of Koi. This classification should in no way be considered as a variety in which to dump the oddly marked Koi! Many gorgeous crossbred Koi come from the Kawarimono variety. Often, these are not bred on purpose, but appear in a spawning as a “sport” koi. 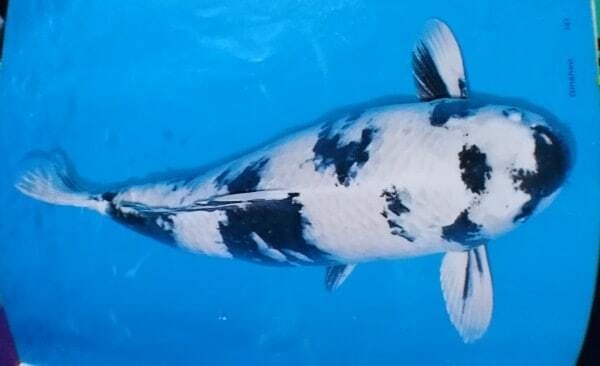 Have you ever seen a soft gray colored koi with gold patterning? If you have, you likely would not forget, because it is very different looking than the brightly colored koi we are used to seeing. This quietly refined and elegant koi is called an Ochiba Shigure, which aptly translates to “autumn leaves on water”. The delicately reticulated scales do indeed give an impression of leaves floating on a calm pond, with the golden-leaved trees reflected on the surface. 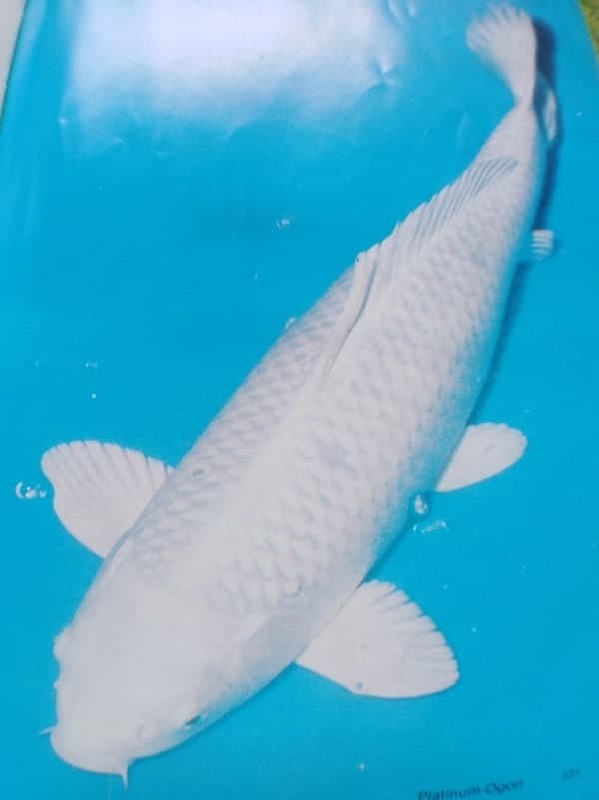 A relative newcomer on the koi scene, having been around only since about the mid-90s, the Ochiba is actually a cross between a gray Soragoi and a golden brown chagoi. These two ancestors have a reputation of being the friendliest of koi, and the Ochiba has happily inherited that trait. Many hobbyists will have one of these types koi in their collection for the purpose of encouraging other, shyer koi to “come out of their shells” and be more sociable. Beni Kumonryu came from Kumonryu and Doitsu Kohaku. Since Doitsu varieties have no scales, their colors can be very bright and bold. Beni Kumonryu are a rare form of Kumonryu, they have red along with the black and white. They are scaless and their pattern actually changes throughout the year. No one is absolutely sure what causes the color change, but the two best theories are a change in temperature or a change in pH. Beni Kumonryu are usually black in the winter. Soragoi, similar to Chagoi, are koi of a solid grey or silver color, combined with a subtle net pattern. Also like Chagoi, mature Soragoi are very docile and will be among the first koi in your pond to learn to hand feed. 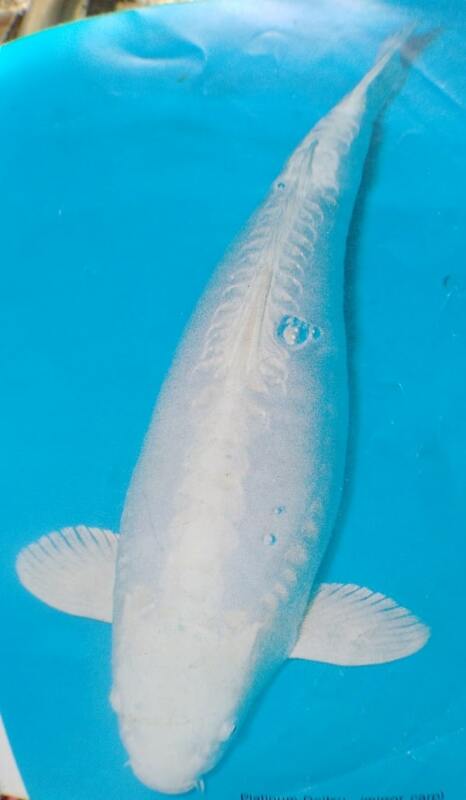 … Soragoi belong to the Ogon group of koi, which appeared in the Showa Period (1926-1989). Ochiba-Shigure is an interesting name for a Koi. The words translate to mean “dead leaves on the water”. These fish are clothed in the basic colors of gray and green with a network of brown lines, rather like the stems of a dead leaf. The word “Hikari” translates from the Japanese to mean “metallic”. Platinun- Ogons are metallic white and are one of the most popular Ogons. 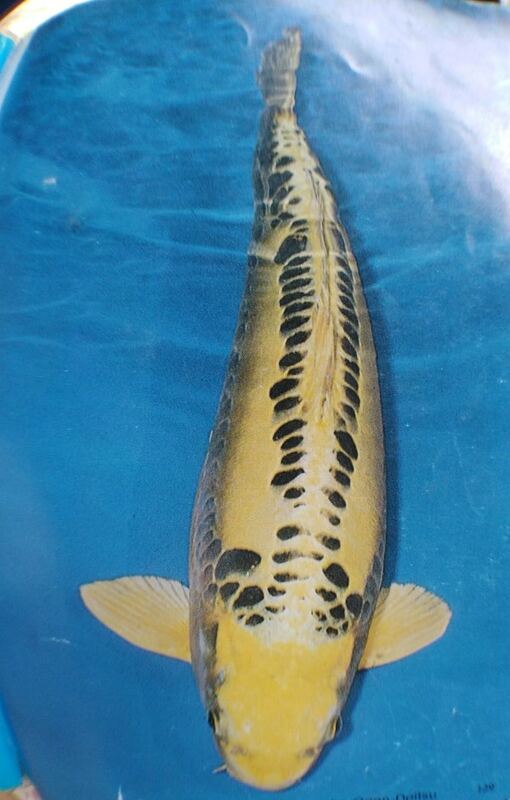 Metallic yellow, or Yamabuki ogon koi. These two colors are the most common, and the easiest shades of ogon koi to purchase. Fuji ogon koi, where only the head of the Koi is metallic Orenji ogon koi, which is all orange like a common goldfish, with a red splotch on its back. Goldfish lovers are usually quite fond og the Orenji. 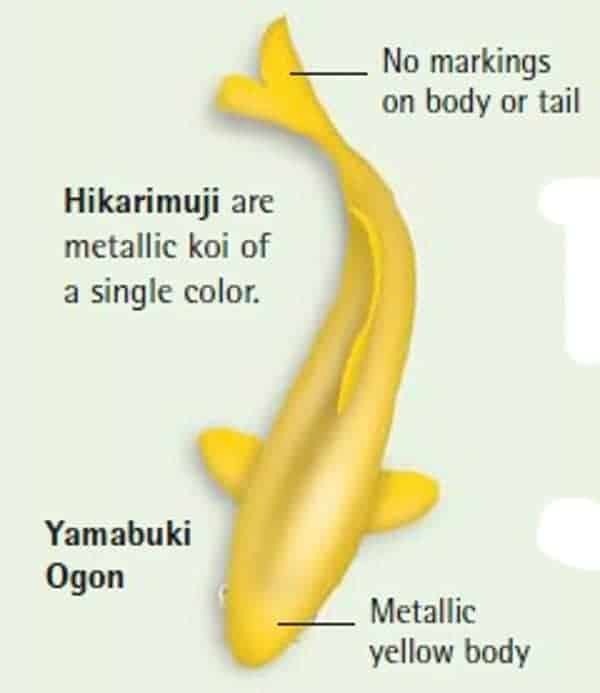 Except for the Fuji, the metallic color of the ogon koi must be the same from the head to the tail, and even flow down to the ends of each fin to be considered “correct”. The size of the fins also matters a great deal. Everyone wants to see long fins on the ogon koi, as they help to counterbalance the plain Koi body. These fish can be a variety of attractive colours. 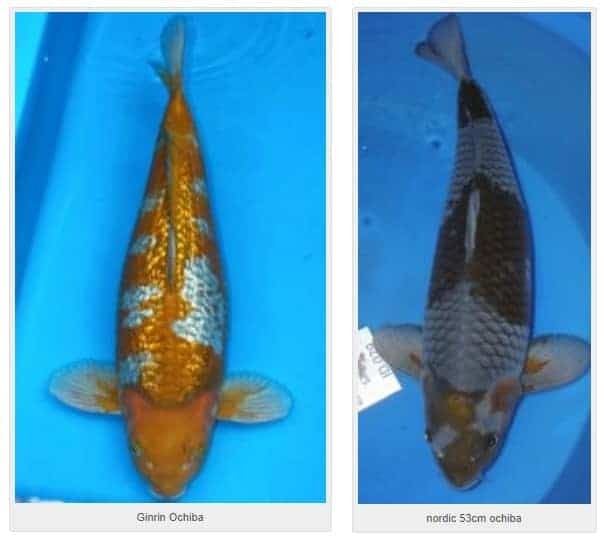 Cream specimens are rare and the most popular choices are bright yellow (Yamabuki ogon koi) and Platinum (Purachina ogon koi). 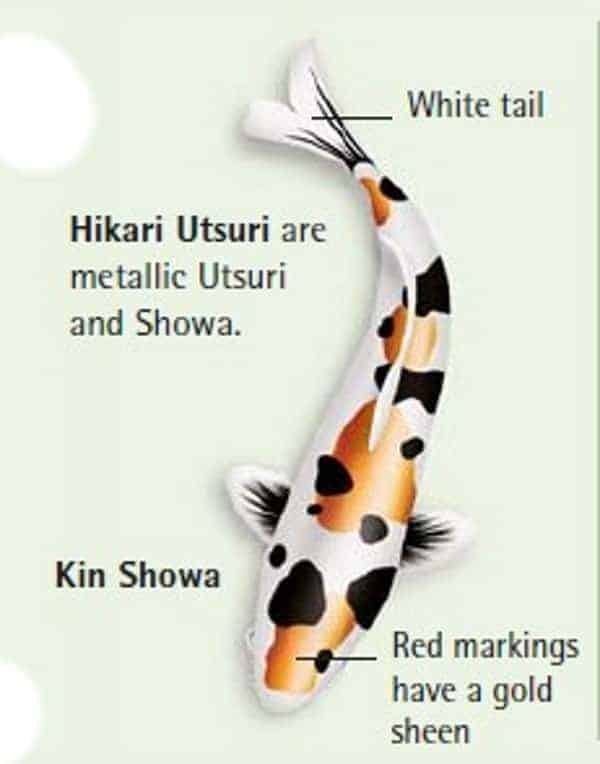 Any Koi that are metallic and have several colors, but do not come from Utsuri lineage are in this group. The development of high quality Kujaku has led to their being judged in a category of their own at recent koi shows. Kujaku are koi with a solid white base, accented by a black net pattern along with patterns of red/orange/yellow. The net pattern is created by a black edging on each individual scale. Variations of Kujaku include Doitsu Kujaku, Tancho Kujaku and Maruten Kujaku. 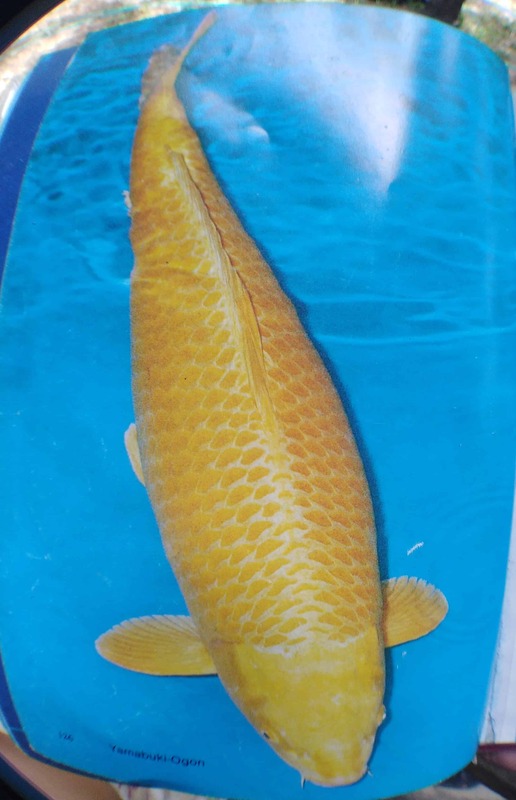 There is another group in this classification, which has fish of two colors, either gold, orange, or platinum. 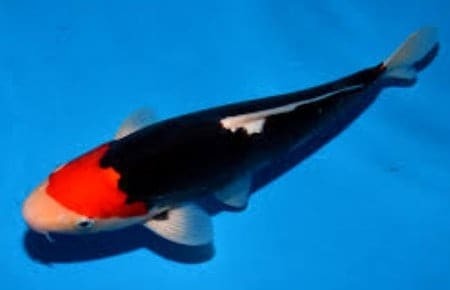 The matsuba koi is basically an Ogon with reticulation. It is a one colored metallic koi with dark pigment on the scales. This variety is in the Hikari Muji class, and is considered one color regardless of the contrasting scales. goshiki koi pronounced (gosh-key or Go-she-key by some) are an interesting breed of Koi. The name means ‘five colors” in Japanese, but frankly it is not a fitting name in my opinion with today’s goshiki koi. You do not readily see five colors at a glance and it is a stretch to do so no matter. This is one breed I feel the Japanese creators misnamed. Most times the Japanese names are right on the money as for descriptive names that tell a story of what the Koi breed looks like. The name was probably created because of the look of some of the first goshiki koi created when they crossed a Sanke to and Asagi. Today yet I don’t see the “:five colors) easily. Anyway, enough about that. 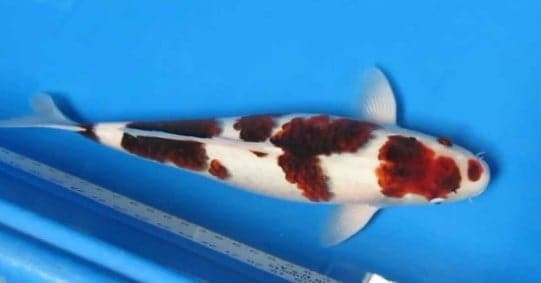 The goshiki koi basically a white based Koi that has a fishnet black pattern on top of the white base that covers the entire back and runs from the top of the back down to the lateral line (center line of the side of the fish that runs from gill plate to tail base). 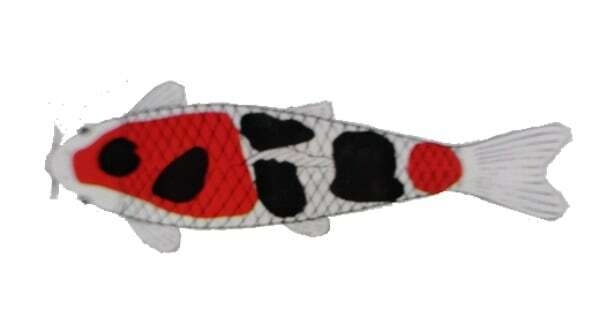 On top of the fishnet pattern there is a red or orange pattern like the Kohaku. This pattern is called the Hi (hee) plate. One difference in this Hi plate from Goshiki to Kohaku is that the Goshiki Hi tends to be much thicker, bolder and more neon in color intensity as compared to the Kohaku Hi plate which can be a glossy red/orange but not neon. The Goshiki Hi plate actually glows and gives the impression of thickness to the point that the Hi plate can look like a sticker stuck on top of the fishes fishnet pattern. There are also offshoot breeds from Goshiki called Goshiki Sanke and Goshiki Showa. We won’t get into those details now though. The term peacock koi refers to the five colors on the body of the koi. The base color of this variety is white and the fins are generally white and free of any pigment. The pattern markings on Goshiki are red, or Hi. 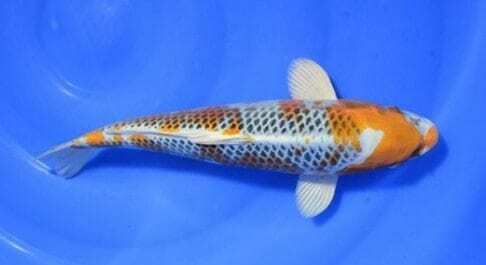 … Kloubec Koi Farm is a breeder of Japanese Goshiki variety koi. 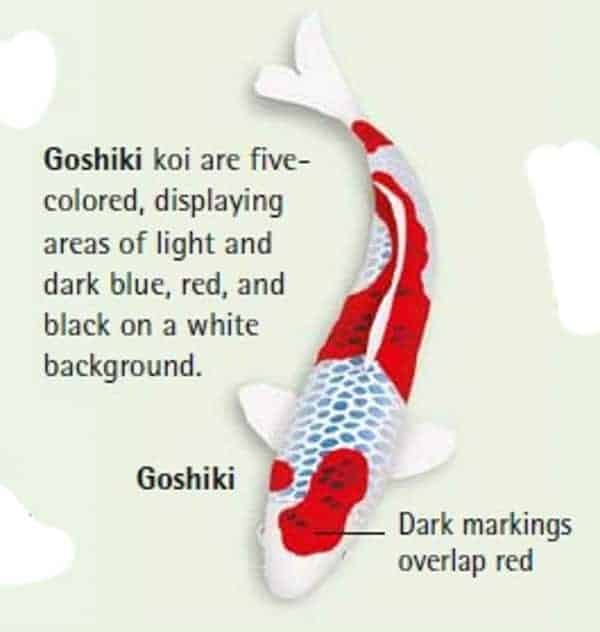 Good read from http://nishikigoi.life article written by Author Mark Gardner Goshiki, a five coloured fish, created in the early 1900s have developed tremendously in recent years to the point where some consider them the 4th Gosanke, in place of Shiro Utsuri. In this article we’ll look at the history of the variety, some of the most prominent breeders and the huge array of different styles that exist. HISTORY According to Dr. Takeo Kuroki’s book ‘Modern Nishikigoi’ Goshiki were produced by crossing Asagi with Aka Sanke or Aka Bekko in 1918. According to Shuji Fujita’s ‘Nishikigoi Mondo’ a primitive Goshiki existed from the mutation of Narumi Asagi and were known as Goshiki Asagi. 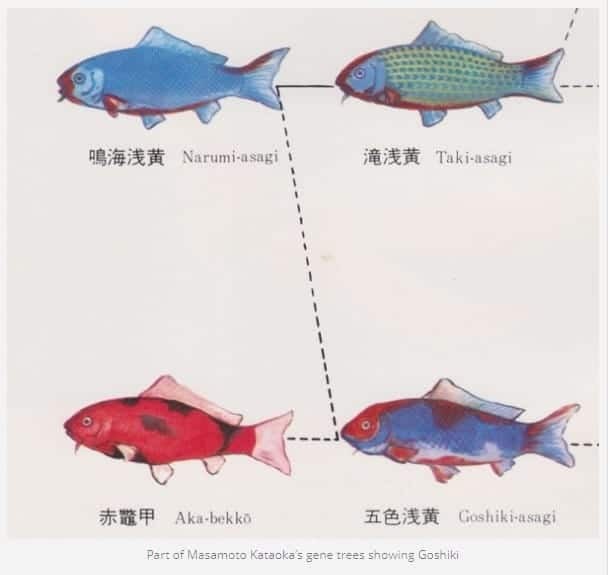 Masayuki Amano’s 1968 ‘General Survey of Fancy Carp’ gives almost no mention to Goshiki, indeed the only references appear in reproductions of Masamoto Kataoka’s gene trees. The first shows Goshiki Asagi being produced from Narumi Asagi and Aka Bekko, to then be bred with Kohaku to produce Koromo. The other shows Goshiki coming from Narumi Asagi. and there should be no superfluous marks on the white to distract the eye from the pristine color. The clarity between the Hi color and the white is called the Kiwa. 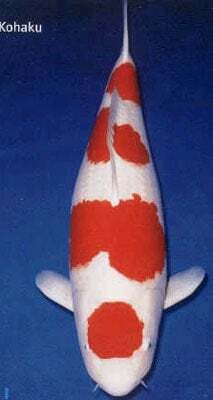 The pattern on the Kohaku should have depth and should be as well balanced as possible. Inazuma, which means lightning strike in Japanese. 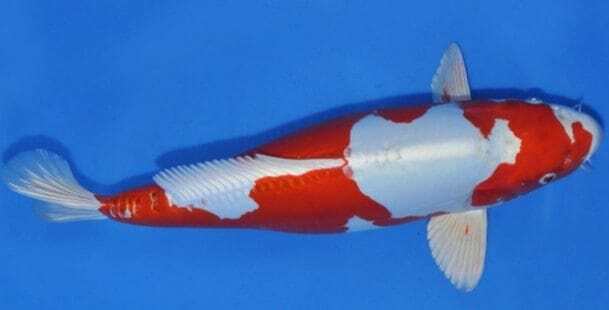 Nidan is the name for two red or Hi markings on the white background of the fish. 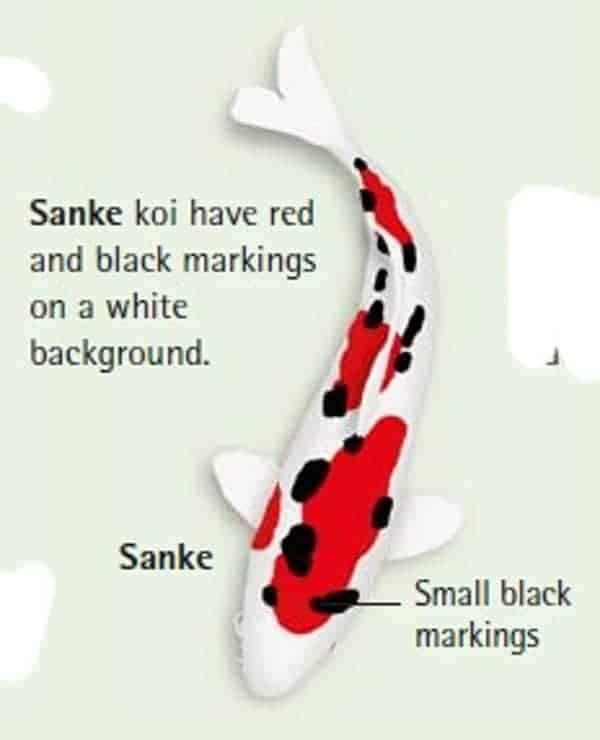 Sandan is the name for three red or Hi markings on the white fish. 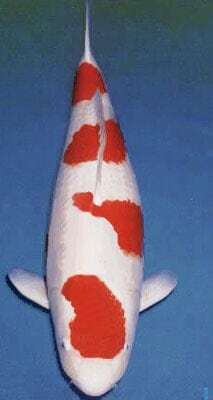 Yondan is the name for four red or Hi markings on the Kohaku. 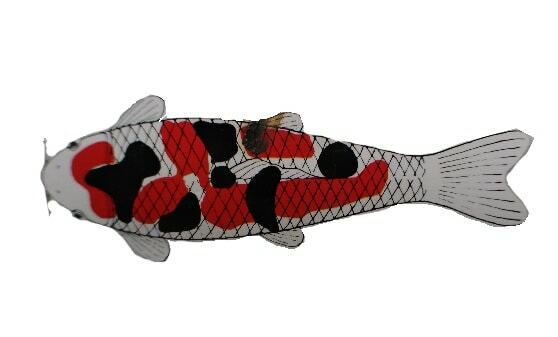 The Taisho Sanke is a Koi carp with three different colors. In this instance, the colors are red, or Hi, black, or Sumi, and white. The color depth and the balance of the pattern on the fish is important, just as it is on the Kohaku. The Taisho Sanke should not have any black (sumi) on the head. his is taken as a sign that the Sumi color should stay even over the entire body of the fish. The red (Hi) patterns may be on just a part of the body, or can extend back over the entire length of the body. 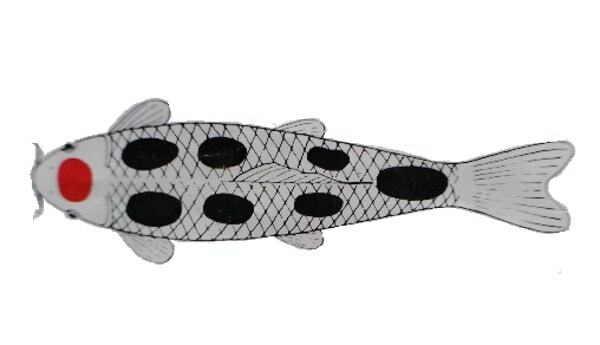 The Showa Sanshoku Koi has much more black (Sumi) included in its patterns than does the Taisho Sanke. In fact, this classification is mostly black with a foreground of red and white markings. Color depth is very important in this variety. The black (Sumi)should be deep and dark, the color of an object made of the dense and dark black wood known as ebony. The red (Hi) markings need to be a blood red color, and the white should be as crisp and clean in appearance as a freshly washed and starched white shirt. 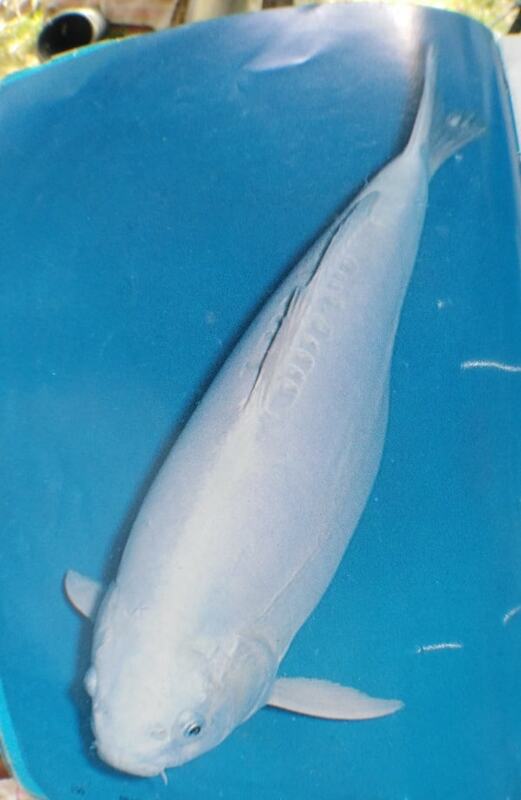 The white color on the Showa Sanshoku should be even and uniform on the base of the pectoral fins. What is a Chagoi koi? Chagoi Koi – Mr. Personality (Chah’-goy) … You’ll discover this pet is probably more intelligent than other koi in your pond too. The Cha-goi is a part of the catchall class known as Kawarimono. “Cha” is the word for a tea-colored Koi that is a very fast grower. The Cha-goi is very easy to tame, and most people thoroughly enjoy having this variety in their pond. How many types of koi are there? 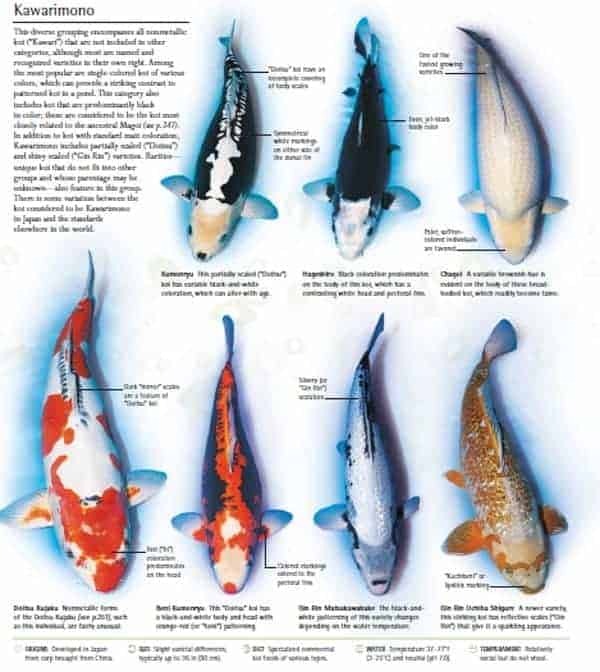 To find the proper koi classification you will need to look at their colors, patterns, and body confirmation. 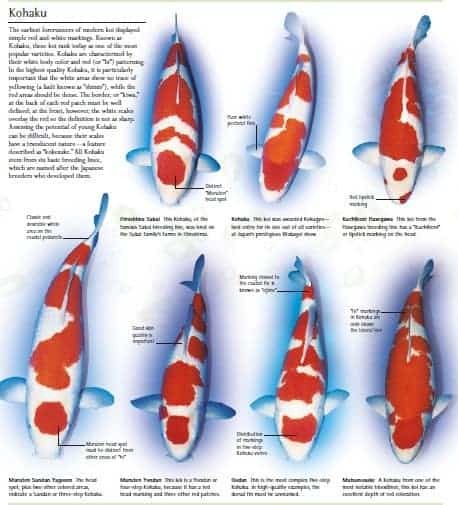 Each type of koi fish variety has it’s own specific details for identification and can described based off another classification of Japanese Koi type. For example, a Showa Sanke is a koi with calligraphic Sumi pattern on Kohaku and the Goshiki created by breeding Asagi with Kohaku. 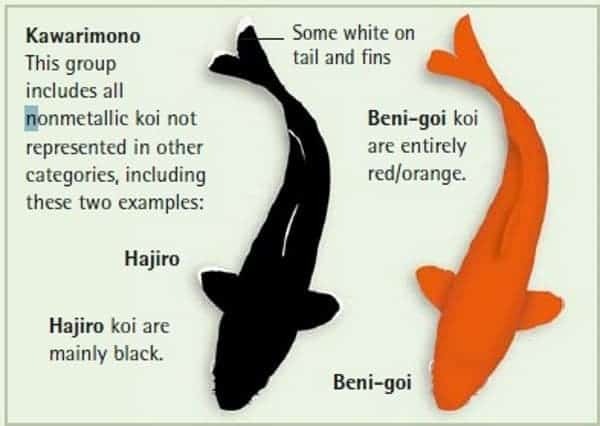 View popular koi varieties below and click to learn about each type of koi. What type of fish is a butterfly koi? Butterfly koi, longfin koi, or dragon carp are a type of ornamental fish notable for their elongated finnage. The fish are a breed of the common carp, Cyprinus carpio, which includes many wild carp races as well as domesticated koi (“Nishikigoi”). … They are also sometimes referred to as Dragon Koi. Also known as American koi, Butterfly koi, Longfin koi, and Dragon koi, the Onagaoi has beautiful long fins reminiscent of a butterfly’s wings. The Japanese bred these koi, hoping to improve the hardiness of all koi by doing so. 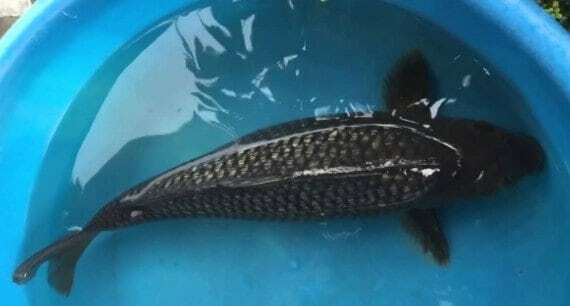 A type of wild fish called Indonesian Longfin river carp were captured by these breeders to use in breeding experiments. 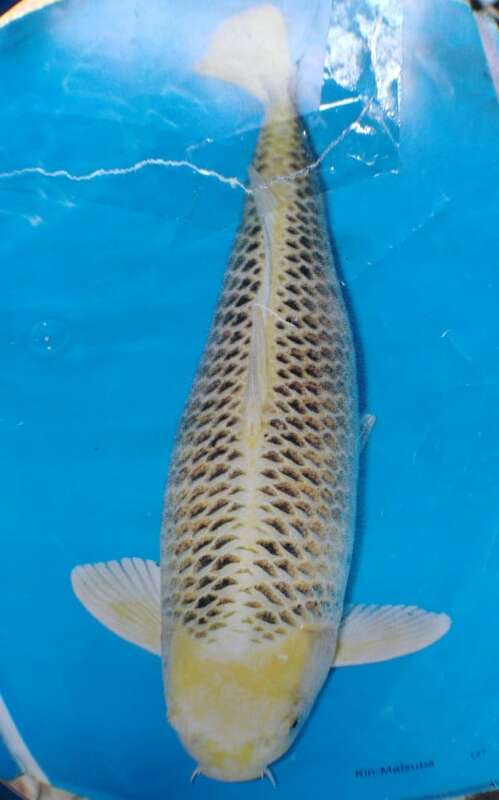 These carp were bred with koi that were more traditional in appearance. The fish that resulted from this breeding had the long fins and the resiliency that hoped for. 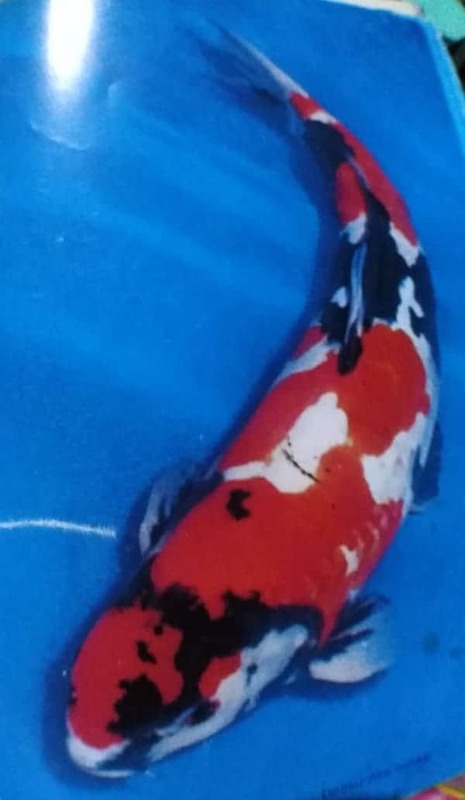 Other breeding experiments carried out in the hopes of setting the different patterns of traditional koi onto the long finned. This attempt at crossbreeding was mostly successful. Many koi purists are adamantly against the Onagaoi. This is the reason why many of the people who sell koi do not offer this variety. Famous breeders in Japan would not think of breeding the Onagaoi. These koi are not popular anywhere in the world except for the United States. Ghost Koi. 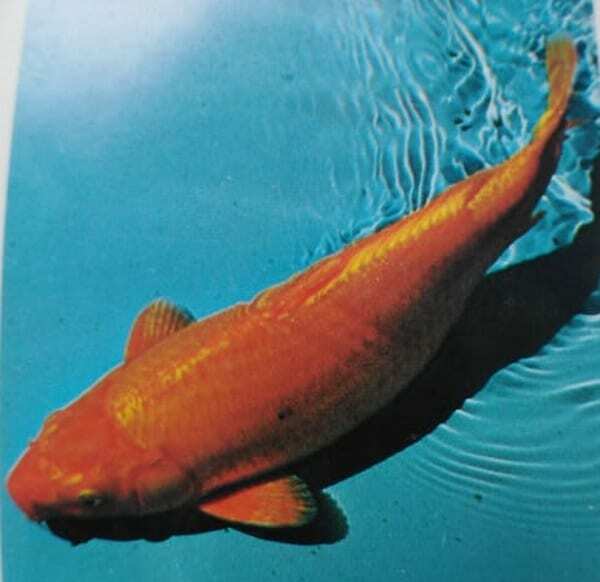 … The Ghost Koi that surfaced in the early ’80s are a hybrid mix of wild carp and single-colored metallic Ogon koi. They are also referred to as Ghost Carp—one of the reasons that koi purists don’t recognize them as true Nishikigoi at all. 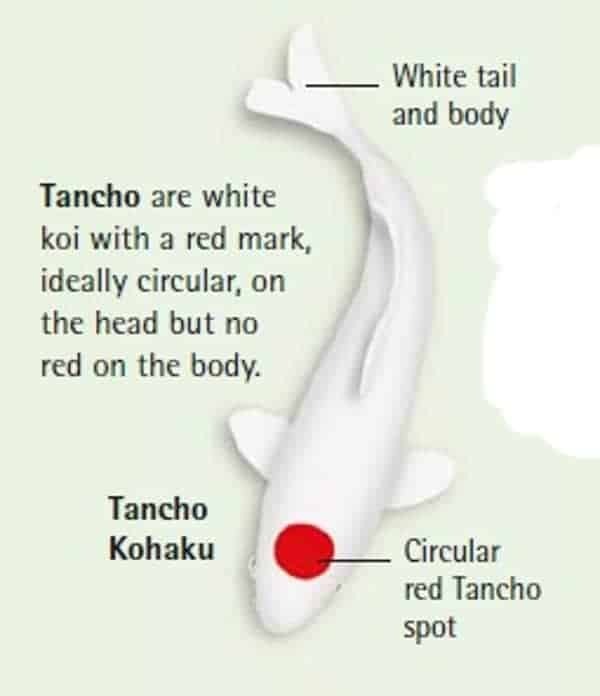 Koi with a red head patch are called “Tancho.” Most common are “Tancho Kohaku (all-white Koi with Tancho),” “Tancho Sanshoku (white Koi with Sumi similar to Shiro Bekko, and with Tancho),” and “Tancho Showa (Showa Sanshoku without red markings except for Tancho),” etc. 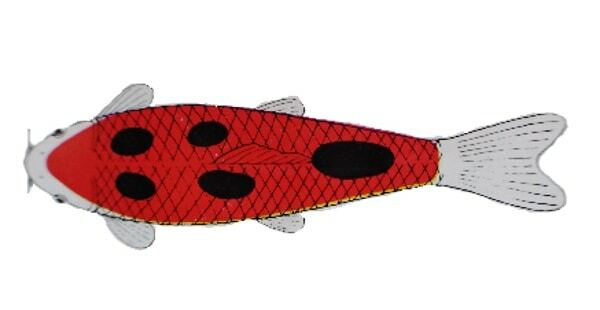 However, “Tancho Goshiki (Koi of five colors with Tancho),” and “Tancho Hariwake” are rare. Tancho do not form a single, independent kind of Nishikigoi; they all can be bred from Kohaku, Taisho Sankshoku or Showa Sanshoku. Their red patch happen to show up only in the head region. Tancho, therefore, can not be produced in bulk even if you so wish. The essential point for appreciation is the red patch in the head region, of course. The red head patch sitting right at the center of the head region is the best. The white skin is also important as it is the milky white color that sets the red head patch off to advantage. The Sumi of Tancho Sanshoku and Tancho Showa are the same as Bekko and Shiro Utsuri respectively. (Kinshiro-Utsuri) It is the Hikarimono of the Shiro-Utusri with much platinum luster. Kin-Ki-Utusri It is the HIkarimono of the Shiro-Utsuri with much platinum luster. Hanako. It purportedly lived to be about 226 years old. activity) and was passed down from generation to generation. What is the oldest living koi fish? 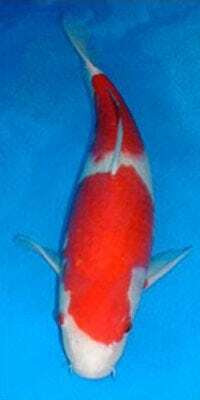 scarlet coloured female Koi called ‘Hanako’ (pronunced hah-nah-koh; translated as ‘Flower Maid’). butterfly koi fish has a long fin koi fish they are also called dragon carp. 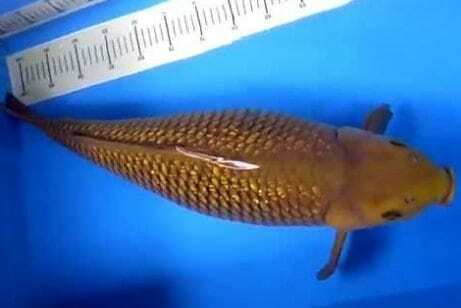 They have elongated finnage the pectoral, caudal and pelvic fins. effort to improve the hardiness of traditional koi fish. wild Indonesian longfin river carp with traditional koi fish. and were hardier than koi fish. These were known in Japan as “onagaoi” or “hire naga goi”, or translated in English “long tail carp”. trait for which the breed is named. They are also sometimes referred to as Dragon Koi fish. butterfly koi fish have long-finned carp are Hirenagagoi. 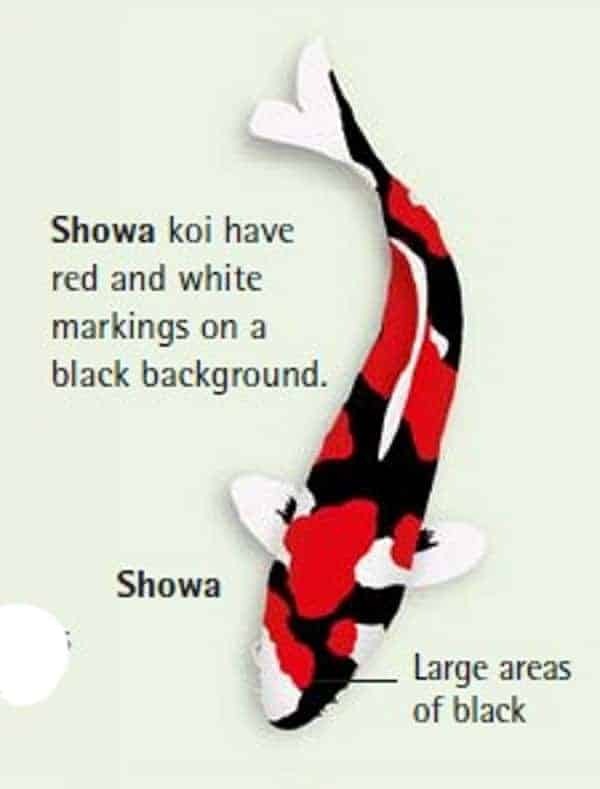 Conformation – The ideal shape of a koi has been set by tradition to be generously oval. By contrast, butterfly koi fish are naturally more slender. done from a top-down viewing angle. important scoring criteria in nishikigoi competitions. applied to nishikigoi by 500 to 1000 percent. traditional koi patterns, (e.g. kohaku, sanke, showa, utsuri and ogon). Butterfly koi, however, exhibit these patterns in a slightly different way. How big do butterfly koi grow in a year? Their barbels (whiskers) even grow long and can fork into elaborate designs. but the overall fish can run as long as 36 to 40 inches in the right pond with plenty of food. They are graceful and pleasant to watch swim. How long does a butterfly koi live? The short answer is they can live over 200 years. The oldest known Koi was Hanako who lived to be 226 years. But the reality is most Koi fish do not live anywhere close to that long. or something simple in a watertight container. requirements of one or more biotic species and or to any human need or purpose. fish native to Asia and Europe. she spent most of her life in a quiet pond at the foot of Mt. Ontake in a locality near Oppara, Higashi-Shirakawa Village, Kamo County. believes led to her thinking that she was fondly loved by and was part of the family. ultimate favorable conditions for Hanako. What is a koi mud pond? Koi Mud Pond. Have clear, safe water and the benefits of mud to keep koi fish healthy for less with TerraPond. living in ion charged mineral ponds. Mud is the perfect environment for koi and top koi farms raise koi in them. How big do butterfly koi get? How much do butterfly koi fish cost? How do you take care of a butterfly koi? What is a butterfly koi fish? Butterfly koi, longfin koi, or dragon carp are a type of ornamental fish notable for their elongated finnage. The fish are a breed of the common carp, Cyprinus carpio, which includes numerous wild carp races as well as domesticated koi (“Nishikigoi”). … They are also sometimes referred to as Dragon Koi. Their barbels (whiskers) even grow long and can fork into elaborate designs. Butterfly koi seem to lack some of the body size of regular koi, but the overall fish can run as long as 36 to 40 inches in the right pond with plenty of food. They are graceful and pleasant to watch swim. Koi can be stunted during the first 18 months of growth, but if it is from good stock they can later still grow to 20″. There are tosia and what some call jumbo tosai. A tosai is basically a first year koi. Fingerlings are a mere 3-4 inches and usually quality Japanese koi are sold as Tosia at a minimum of 7-8″. Look at the different types of koi fish below look at their respective variety and refer it to the chart above then you can now easily Identify them if you can memorize the koi fish meaning into English from Japanese terms. 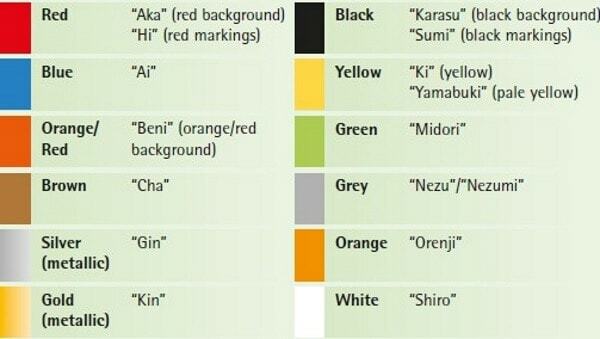 Japanese descriptions of color are important in koi nomenclature. Some have many names depending on the form in which that color appears. Japanese descriptions, even if they have been bred in other countries. The most popular varieties, known as “Go Sanke,” are the Showa, Kohaku, and Sanke. have an overall reflective luster, while all others are known as nonmetallic. 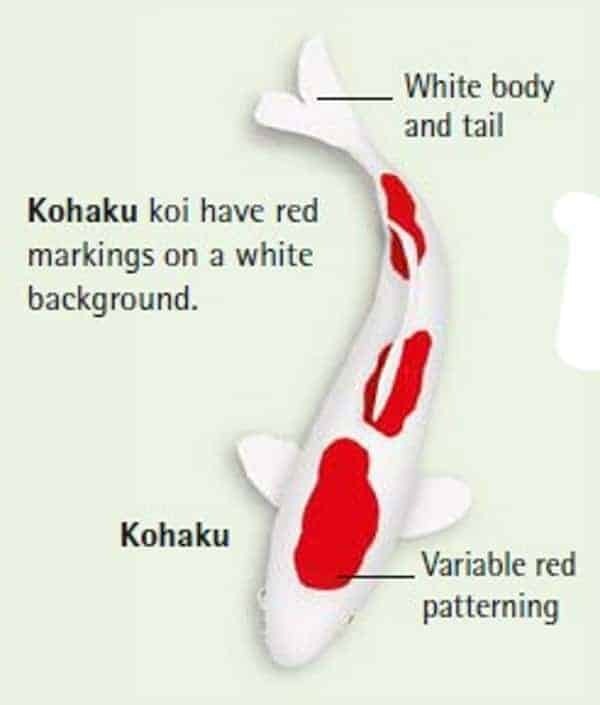 a koi is influenced by its pattern of scalation. Gin Rin,” or simply “Gin Rin,” is characterized by the sparkling appearance of the scales. What does a black koi fish represent? particularly represent good fortune in business and academics. Buddhists on the other hand see koi as representations of courage. Together in a koi pond, they represent love and friendship. The koi fish has profound meaning, according to Japanese legend. … The black koi is associated with successfully overcoming an obstacle.